If you can let go of things that just aren’t worth holding onto any longer, you can see just how bright your future can really be. The Kabbalistic title of the Ten of Swords tarot card, Lord of Ruin, only tells half the story. Okay, there’s a man bleeding on the ground, and ten swords are stuck in his back. No, that doesn’t look good. But look at his hand in the Ten of Swords. It’s making the sign of benediction. That’s a blessing. Onlookers might think he’s been defeated, but he has actually won a spiritual victory. It’s all symbolic. Look, alchemists write about stuff like “the Green Lion” all the time, but that doesn’t mean they take buckets of green paint to the zoo! The astrological correspondence, Sun in Gemini, gives you an important clue: Here the intellect has separated “the subtle from the dense,” as the Emerald Tablet of Hermes Trismegistus puts it. It has separated the small, unimportant stuff from what’s really important in life. It’s perceived as ruin because so many people get too riled up over stuff that doesn’t really matter. The man in the Ten of Swords lying on the ground isn’t worried about these things anymore. He’s looking at that perfect Blue water, which is clear and still. His next, spiritual journey will take him across it to that range of Blue mountains, new spiritual heights, on the horizon. The man in the Ten of Swords sees the Golden morning sky drive away those Black clouds of despair. The swords piercing him are at rest in the Ten of Swords. Six are through the Red drape covering his lower body, showing that he has mastered his passions. Four are buried in the Brown garment on his upper body, which means that he is no longer worrying about material concerns. Any loss the Ten of Swords card may suggest isn’t as big as you make it because, let’s face it, it only takes one sword to kill so ten is, well, overkill. In fact, whatever it is you “lost” may have just been moved out of the way so you can see the open doors which lead to much better things. Remember, the Suit of Swords is about intellect and rational thought so use your sharp mind to look at the current situation as it really is. Healing and progress will come from accepting the truth. With that come clarity and the wisdom to make the right decisions. You won’t let it happen again. An unbearable situation, such as a relationship with an unfaithful partner, is over. Yes, it hurts. But now you’re seeing that person for who he or she really is. Moreover, this experience has made you wise enough to spot those red flags early. That will keep you from getting yourself into the same mess again. When you’re back on your feet, you’ll be singing right along with Roger Daultry when that song plays on the radio. Analyzing your situation more closely, you may come to see that things aren’t nearly as bad as you make them out to be. Once you let go of the hurt, you’ll realize that it’s clear sailing from here on. Congratulations, you’ve passed your last ordeal. Yes, you’ve been sweating over those final exams, but you’re not the kind of person who’ll spend the rest of the summer complaining about how hard they were. You’re already packing your bags for that trip to Cancun. Have a great time and don’t forget the sunscreen! Another interpretation of the Ten of Swords tarot card suggests that unforeseen circumstances can undo your plans. Roll with the punches, dust yourself off, and get back in the ring. Sometimes, things just happen, and there’s nothing you can do about it. The Ten of Swords tarot also points to a crucial stage in your spiritual development. Your experiences have taught you another way of looking at yourself and the universe. The answers to important questions are no longer theoretical to you. In your mind, there is no longer any doubt, whether or not there is life after death, or whether there is a god or not. When reversed, the Ten of Swords tarot card is like the last hurrah before the inevitable happens. The current of the upright card can’t really be stopped. There are some painful endings on the way but that’s okay, because when something is truly over the only thing to be done is learn from the past and move on. 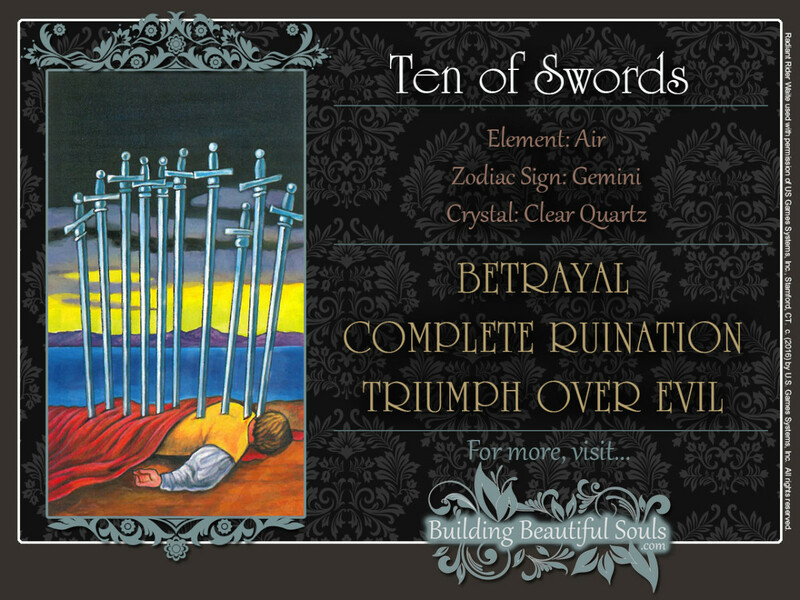 In this, the Ten of Swords reversed brings clarity and a better understanding of your true destiny. Are you afraid of change or do you embrace it? Fear can keep you from making important progress in your personal or spiritual development. People who are recovering from chemical dependency often worry about leaving their drinking and using friends behind. Yes, that’s a tough decision. But sometimes that’s the only healthy choice you have. Sometimes, the Ten of Swords tarot card also announces a financial windfall. It won’t be enough to retire on, so you’ll have to use that money wisely. Perhaps you’ve attracted the attention of a powerful person, and he or she is looking at you with favor. But if you want to make it last, you’ll have to work at it. Similarly, relocating to another part of the country can make some problems you’re experiencing here go away for a while. But unless you use this chance to make some permanent positive changes, your problems will catch up with you eventually – wherever you may be. On the other hand, if you’re willing to let the cycle you are going through run its course, things will even out in the end. You’ll be able to see the big picture – and your place in it. Chances are, you’ll find that it isn’t so bad, after all. No matter how badly others may have hurt you, there’s a part deep inside they haven’t been able to touch. As nagging doubts give way to new insights, you’ll eventually feel a new sense of vitality. Be patient and things will improve on all fronts over time. The tens symbolize the completion of one cycle and the beginning of a new one in both, Kabbalistic and traditional numerology. Here, the process of the intellectual analysis has run its full course. The meaning of everything has been reduced to zero. But since something – or someone – had to do the reducing, so a new journey of spiritual inquiry is about to begin.